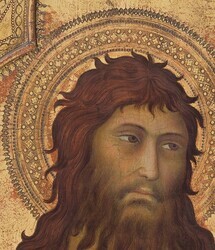 Miklós Boskovits (1935–2011), “Lippo Memmi/Saint John the Baptist/probably c. 1325,” Italian Paintings of the Thirteenth and Fourteenth Centuries, NGA Online Editions, https://purl.org/nga/collection/artobject/434 (accessed April 26, 2019). The inscription fragment on the scroll is from John 1:29, which reads, “Here is the Lamb of God, who takes away the sin of the world.” These are the words Saint John the Baptist spoke to Jesus, when Jesus encountered him baptizing beyond the Jordan River. Living in the wilderness, the saint was clothed in a camel skin, and his hair was matted—just as we see him here. This image, which has been assessed as one of Lippo Memmi’s finest works, was probably created for the church of San Giovanni Battista in the Tuscan hill town of San Gimignano, about 30 miles from Lippo’s home in Siena. It was part of an imposing altarpiece, of which five panels depicting saints (Peter, Paul, John the Evangelist, Francis, and Louis of Toulouse) have been identified in other museums. Originally, they would have been arranged on either side of a slightly larger central image, perhaps of the Madonna and Child. This painting would probably have been on the immediate left—the position of honor to the right of the central figure—as befitting the saint in his own church (see Reconstruction). When this painting first entered the National Gallery of Art, it was attributed to Lippo’s sometime collaborator and brother-in-law, Simone Martini (Sienese, active from 1315; died 1344), whose graceful and elegant style exerted an international impact on late Gothic art. (See The Angel of the Annunciation for an example in the Gallery’s collection.) Here, though, the saint’s slender body and round face, with narrow eyes under arched brows and a long nose, point to Lippo’s unique style. So do the soft colors that complement the saint’s mood of tranquil reflection. Alessandro Bagnoli, “La chiesa di San Francesco a Colle di Val d’Elsa: Intenti per un restauro globale,” in Restauri e recuperi in terra di Siena: XI Settimana dei Beni Culturali, ed. Cecilia Alessi and Cristina Gnoni Mavarelli (Badesse–Monteriggioni [Siena], 1995). Conjecturing the authorship of Simone Martini, Raimond van Marle (1934, 1935) proposed the date c. 1320, followed by Alfred Frankfurter (1944). Duveen Pictures 1941 reproposed the same attribution but suggested a dating to the years 1315–1320. A dating to 1325–1330 was supported by Gertrude Coor (1961), Fern Rusk Shapley (1966, 1979), Millard Meiss (1977), NGA 1985, Cristina De Benedictis in her more recent contributions (1992, 1996), and Marianne Lonjon (2006). Antonino Caleca (1976), for his part, vaguely dated the panel to the decade 1320–1330, while Alessandro Ba­gnoli (1999) proposed its execution in the years 1323–1325, and Pierluigi Leone De Castris (2003) in those between 1326 and 1328. De Benedictis (1974) initially suggested a dating to c. 1330, followed by Michael Mallory (1974, 1975); Michel Laclotte (1978); Federico Zeri (in Zeri and Gardner, 1980); Keith Christiansen (1982); and Mauro Natale, Alessandra Mottola Molfino, and Joyce Brusa (1982). See Raimond van Marle, Le scuole della pittura italiana, vol. 2, La scuola senese del XIV secolo (The Hague, 1934), 210, fig. 142; Raimond van Marle, “La pittura all’esposizione d’arte antica italiana di Amsterdam,” Bollettino d’arte 27 (1935): 297, fig. 4; Alfred M. Frankfurter, The Kress Collection in the National Gallery (New York, 1944), 21, 63; Duveen Brothers, Duveen Pictures in Public Collections of America (New York, 1941), no. 13; Gertrude Coor, “Two Unknown Paintings by the Master of the Glorification of St. Thomas and Some Closely Related Works,” Pantheon 19 (1961): 129–130, 133–134 n. 15, 135 n. 25; Fern Rusk Shapley, Paintings from the Samuel H. Kress Collection: Italian Schools, XIII–XV Century (London, 1966), 49, fig. 126; Fern Rusk Shapley, Catalogue of the Italian Paintings, 2 vols. (Washington, DC, 1979), 1:331–333; Millard Meiss, “Notes on a Dated Diptych by Lippo Memmi,” in Scritti di storia dell’arte in onore di Ugo Procacci, ed. Maria Grazia Ciardi Dupré Dal Poggetto and Paolo Dal Poggetto, 2 vols. (Milan, 1977), 1:139; National Gallery of Art, European Paintings: An Illustrated Catalogue (Washington, DC, 1985), 231; Cristina De Benedictis, “Mario Salmi collezionista,” in Studi di storia dell’arte sul Medioevo e il Rinascimento: Nel centenario della nascita di Mario Salmi (Florence, 1992), 129; Cristina De Benedictis, “Lippo Memmi,” in Enciclopedia dell’arte medievale, 12 vols. (Rome, 1996), 7:733; Marianne Lonjon, “Précisions sur la provenance du retable dit ‘de Colle di Val d’Elsa’ de Lippo Memmi,” La revue des musées de France 56 (2006): 34, 38 n. 1, 39 n. 13; Antonino Caleca, “Tre polittici di Lippo Memmi, un’ipotesi sul Barna e la bottega di Simone e Lippo, 1,” Critica d’arte 41 (1976): 53, fig. 59; Alessandro Bagnoli, La Maestà di Simone Martini (Cinisello Balsamo, Milan, 1999), 142, 151 n. 184; Pierluigi Leone De Castris, Simone Martini (Milan, 2003), 181, 218 n. 49; Cristina De Benedictis, “A proposito di un libro su Buffalmacco,” Antichità viva 13, no. 2 (1974): 8; Michael Mallory, “An Altarpiece by Lippo Memmi Reconsidered,” Metropolitan Museum Journal 9 (1974): 187–188; Michael Mallory, “Thoughts Concerning the ‘Master of the Glorification of St. Thomas,’” The Art Bulletin 57 (1975): 18–20; Michel Laclotte, in Retables italiens du XIIIe au XVe siècle, ed. Claude Ressort, Sylvia Beguin, and Michel Laclotte (Paris, 1978), 19; Federico Zeri, in Federico Zeri and Elizabeth E. Gardner, Italian Paintings: Sienese and Central Italian Schools; A Catalogue of the Collection of the Metropolitan Museum of Art (New York, 1980), 50–52; Keith Christiansen, “Fourteenth-­Century Italian Altarpieces,” Bulletin of the Metropolitan Museum of Art 40 (1982): 26, fig. 25; Mauro Natale, Alessandra Mottola Molfino, and Joyce Brusa, Museo Poldi Pezzoli, vol. 1, Dipinti (Milan, 1982), 145. In the Pisan altarpiece, particularly eloquent analogies with the San Gimignano polyptych are offered by the figure of Saint Paul to the upper left (to be compared with the image of the same saint now in the Metropolitan Museum of Art, New York) and some faces among the friars and religious people gathered at Saint Thomas’s feet, similar in facial type to the Saint Louis in Siena. The Triumph of Saint Thomas nevertheless lacks the pursuit of the nobility of features, with its subtly modulated profile, and the measured, curvilinear rhythms of the contours of the tunics and mantles that distinguish the panel of the Baptist in the Gallery and its companion paintings. The figures of the Pisan polyptych seem taller and more slender, and they move with greater ease, than the figures of the Baptist or of Saints Peter and Paul in the complex destined for San Gimignano. This might also depend on the unusual iconography (the representation of the saints seated on faldstools), but their solemn and composed attitude, the faces modeled with subtly filtered light, and the delicate shading that minutely explores each detail of the form anticipate phenomena that characterize Lippo’s paintings in the early 1330s. Another aspect that invites comparison between the Pisa and San Gimignano polyptychs is the dynamic calligraphy, intermittent in tension, of the contour lines. In the Gallery’s panel and its companions, the artist’s preoccupation with decorative elements, and especially his concern with embellishing even the outer edges of the painted surface with punched motifs, suggest that the San Gimignano polyptych is slightly later in date than the Pisa polyptych of 1325. Mojmir S. Frinta (1998) pointed out the presence of the punch mark he called “complex tetra-lobe (tetrafoil)” both in the panel in the Gallery and in the former Chiaramonte Bordonaro Saint Peter (now in the Galleria Nazionale in Palermo). This punch also recurs in other Lippo works, including the Casciana Alta polyptych and the triptych of the Annunciation dated 1333 in the Uffizi, Florence, executed in collaboration with Simone Martini. See Mojmir Svatopluk Frinta, Punched Decoration on Late Medieval Panel and Miniature Painting (Prague, 1998), 400. But it is above all the accomplished drawing, especially evident in the harmonious curvilinear rhythms of the contours; the self-assured elegance of the poses; and the softness of the modeling that testify that the two complexes were executed in the same phase of Lippo’s art. Sufficient evidence does not exist to establish with certainty whether the one polyptych takes precedence over the other in date, even though I am inclined to think that the altarpiece painted for the Franciscans in San Gimignano is somewhat later than the other, to which the sources attach the date 1325. One thing is certain: the Washington Saint John the Baptist was painted in the artist’s full maturity, the phase in which his output reached its highest levels. That explains, even if it cannot justify, the now obsolete attribution to Simone Martini. Probably church of San Francesco, San Gimignano, until 1553; church of San Giovanni Battista, San Gimignano, until 1782/1787; church of San Francesco, Colle Val d’Elsa, between 1787 and mid-nineteenth century. Graf von Oriola, Schloss Budesheim, Oberhessen; (his sale, Mensing & Fils at Frederik Muller & Co., Amsterdam, 13 April 1932, no. 3, as by Taddeo di Bartolo). (Jacques Goudstikker, Amsterdam), by 1934; purchased February 1937 through (Paul Cassierer & Co., Amsterdam) by (Duveen Brothers, Inc., London, New York, and Paris); sold June 1938 to the Samuel H. Kress Foundation, New York; gift 1939 to NGA. In 1865 Francesco Brogi saw two of the original companion panels to the NGA’s painting in the church of the Franciscans of Colle Val d’Elsa (not published until 1897: Francesco Brogi, Inventario generale degli oggetti d’arte della provincia di Siena, Siena, 1897: 158). However, it has been convincingly suggested (Alessandro Bagnoli, "La Chiesa di San Francesco a Colle di Val d'Elsa, intenti per un restauro globale," in Restauri e Recuperi in terra di Siena. XI Settimana dei Beni Culturali, Sienna, December 1995: n.p. ; Alessandro Bagnoli, La Maestà di Simone Martini, Milan, 1999: 151 n. 184; Marianne Lonjon, “Précisions sur la provenance du retable dit 'de Colle val d’Elsa' de Lippo Memmi,” Revue des Musée de France 56, no. 2 : 31-40) that they were transferred there only in the late eighteenth century from the church of the same order in San Gimignano; it may be presumed that they had originally adorned its high altar. Situated outside the city walls, the church of San Francesco in San Gimignano was demolished in 1553, when, by order of Cosimo I de’ Medici, a new system of fortifications was erected around the city. After the 1553 demolition of their church of San Francesco, the Franciscans moved inside the city of San Gimignano, settling in the convent annexed to the church of San Giovanni Battista. In 1782 Duke Leopold suppressed this convent, forcing the friars to make another move. The community of friars moved to the convent of San Francesco in Colle Val d’Elsa in 1787, likely bringing with them all the church furnishings from San Gimignano. As mentioned above (note 1), two companion panels, Memmi’s Saint Francis and Saint Louis of Toulouse (both now in the Pinacoteca Nazionale in Siena), were recorded by Francesco Brogi in 1865 as hanging in the sacristy of the Franciscan church of Colle. The other panels of the dismembered altarpiece were no longer there at this time. The auction catalog offered for sale a “Collection Comte Oriola, formée en Italie de 1860-1896 env.,” without further explanation. Lot 1 of the sale was a detached fresco by Perugino representing the Pietà, which apparently remained unsold (now in the collection of the Cassa di Risparmio in Florence). Walter and Elisabeth Paatz (Die Kirchen von Florenz. Ein kunstgeschichtliches Handbuch, 6 vols., Frankfurt am Main, 1940-1953: 4 : 649-650, n. 35) cite the fresco as belonging to the heirs of Graf Oriola in Büdesheim, Oberhessen, the location of the collection. The year 1883 is stated as the date of Graf Oriola’s acquisition. An Italian stone relief representing the Profile Portrait of a Man, lot 46 of the 1932 sale in Amsterdam, which similarly found its way into the Kress Foundation’s collection in 1938 and subsequently into the Philbrook Art Center in Tulsa, is also stated to have belonged to the Oriola Collection in Büdensheim; see Ulrich Middeldorf, Sculptures from the Samuel H. Kress Collection. European Sculptures, London, 1976: 67. It is possible that the “Comte Oriola” named in the sale catalogue referred to Eduard Ernst Lobo da Silveira (1809-1862) and his sons, Waldemar (1854-1910) and Joachim (1858-1907) Lobo da Silveira, all of whom were known as Graf von Oriola. They were the son and grandsons, respectively, of a Portuguese minister, Joaquim José Lobo da Silveira (1772-1846), who was given a title in the Prussian nobility by Friedrich Wilhelm III, king of Prussia (1770-1840) and who resettled his family in Prussia. Waldemar had Schloss Büdesheim constructed in 1885 near an older castle of the same name, and Joachim was a naval attaché in the German embassy in Italy. Goudstikker lent the painting to an exhibition in Amsterdam in 1934. On the life and career of the Dutch dealer see Charlotte Wiefhoff, “De Kunsthandelaar Jacques Goudstikker 1897 - 1940,” Nederlands Kunsthistotisch Jaarboek 32 (1982): 249-278. Duveen Brothers Records, accession number 960015, Research Library, Getty Research Institute, Los Angeles: reel 119, box 264, folder 8; reel 121, box 266, folder 18 (copies in NGA curatorial files). The bill of sale for eight paintings, including this one, is dated 21 June 1938; payments were to extend through November 1939. The attributions on the bill, in this case to Simone Martini, were those of Bernard Berenson. Duveen Brothers Records, accession number 960015, Research Library, Getty Research Institute, Los Angeles: reel 329, box 474, folder 5 (copies in NGA curatorial files). Italiaansche Kunst in Nederlandsch Bezit, Stedelijk Museum, Amsterdam, 1934, no. 222, repro., as by Simone Martini. Cf. Fern Rusk Shapley, Paintings from the Samuel H. Kress Collection: Italian Schools, XIII–XV Century (London, 1966), 49; Fern Rusk Shapley, Catalogue of the Italian Paintings, 2 vols. (Washington, DC, 1979), 1:333. Probably on the same occasion the edges of the panel were cut along the pointed arch. An initial layer of paint applied to a ground that begins to define shapes and values. is present beneath the flesh tones. The gilded areas were prepared with an orange-red layer of bole. Punchwork decorates the halo as well as the outer edges of the gold ground and the curved spandrels between the pointed external arch and the trefoil-shaped inner frame. Applying transparent layers of paint that influence the colors or tonalities of the layers below. during one or both of these treatments. A thick and discolored layer of varnish now covers the surface. Collection Comte Oriola, formée en Italie de 1860-1896 Env. : tableaux, sculptures, tapisseries... acquis en grande partie des collections Bardini, Borghese etc., vente publique à Amsterdam, direction Mensing & Fils, le 13 avril 1932. Amsterdam, 1932: lot. 3. Marle, Raimond van. Le scuole della pittura italiana. 2 vols. The Hague and Florence, 1932-1934: 2(1934):210, fig. 142. Marle, Raimond van. Italiaansche Kunst in Nederlandsch Bezeit. Exh. cat. Stedelijk Museum. Amsterdam, 1934: 85, fig. 222. Beenken, Hermann. "Review of Le scuole della pittura italiana II by Raimond van Marle." Zeitschrift für Kunstgeschichte 4 (1935): 356. Rinaldis, Aldo de. 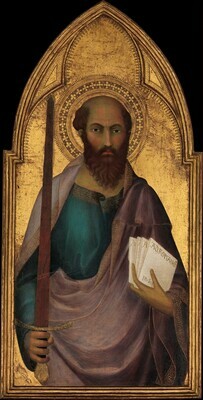 Simone Martini. Rome, n.d. : 79. Comstock, Helen. "The World’s Fair and other Exhibitions." Connoisseur 103 (1939): 277. Duveen Brothers. Duveen Pictures in Public Collections of America. New York, 1941: no. 13, repro., as by Simone Martini. National Gallery of Art. Book of Illustrations. Washington, 1941: 186 (repro. ), 241 as by Simone Martini. Preliminary Catalogue of Paintings and Sculpture. National Gallery of Art, Washington, 1941: 185, no. 402, as by Simone Martini. Book of Illustrations. National Gallery of Art, Washington, 1942: 247, repro. 189, as by Simone Martini. Frankfurter, Alfred M. The Kress Collection in the National Gallery. New York, 1944: 21, repro., as by Simone Martini. Zeri, Federico. "An Exhibition of Mediterranean Primitives." The Burlington Magazine 94 (1952): 321. Steinweg, Klara. "Beiträge zu Simone Martini und seiner Werkstatt." Mitteilungen des Kunsthistorischen Institutes in Florenz 7 (1956): 167. Paintings and Sculpture from the Samuel H. Kress Collection. National Gallery of Art, Washington, 1959: 31, repro., as by Simone Martini. Ranucci, Cristina. "Lippo di Memmo di Filippuccio (Memmi)." In Dizionario biografico degli italiani. Edited by Alberto Maria Ghisalberti. 82+ vols. Rome, 1960+: 65(2005):227. Volpe, Carlo. "Precisazioni sul ‘Barna’ e sul ‘Maestro di Palazzo Venezia.’" Arte antica e moderna (1960): 157 n. 10. Coor, Gertrude. "Two Unknown Paintings by the Master of the Glorification of St. Thomas and Some Closely Related Works." Pantheon 19 (1961): 129-130, 133-134 n. 15, 135 n. 25, fig. 9. Walker, John. National Gallery of Art, Washington, D.C. New York, 1963 (reprinted 1964 in French, German, and Spanish): no. 298, repro., as by Simone Martini. Shapley, Fern Rusk. Paintings from the Samuel H. Kress Collection: Italian Schools, XIII-XV Century. London, 1966: 49, fig. 126. Berenson, Bernard. The Italian Painters of the Renaissance. 2 vols. London and New York, 1968: 2:270. Bologna, Ferdinando. I pittori alla corte angioina di Napoli, 1266-1414, e un riesame dell’arte nell’età fridericiana. Rome, 1969: 335 n. 7. Contini, Gianfranco, and Maria Cristina Gozzoli. L’opera completa di Simone Martini. Milan, 1970: 105, no. 54. Seymour, Charles. Early Italian Paintings in the Yale University Art Gallery. New Haven and London, 1970: 92. Delogu Ventroni, Sebastiana. Barna da Siena. Pisa, 1972: 59. Fredericksen, Burton B., and Federico Zeri. Census of Pre-Nineteenth Century Italian Paintings in North American Public Collections. Cambridge, Mass., 1972: 141, 646, 662. De Benedictis, Cristina. "A proposito di un libro su Buffalmacco." Antichità viva 13, no. 2 (1974): 8. Mallory, Michael. "An Altarpiece by Lippo Memmi Reconsidered." Metropolitan Museum Journal 9 (1974): 187-188, fig. 5. Mallory, Michael. "Thoughts Concerning the ‘Master of the Glorification of St. Thomas.’" The Art Bulletin 57 (1975): 18-20. Caleca, Antonio. "Tre polittici di Lippo Memmi, un’ipotesi sul Barna e la bottega di Simone e Lippo, 1." Critica d’arte 41 (1976): 53, fig. 59. Mallory, Michael. The Sienese Painter Paolo di Giovanni Fei (c. 1345-1411). New York and London, 1976: 102-103, pl. 37. Bennett, Bonnie Apgar. Lippo Memmi, Simone Martini’s “fratello in arte”: The Image Revealed by His Documented Works. Ph.D. dissertation, University of Pittsburgh, 1977. Ann Arbor, MI, 1979: 102-103, pl. 37. Caleca, Antonio. "Tre polittici di Lippo Memmi, un’ipotesi sul Barna e la bottega di Simone e Lippo, 2." Critica d’arte 42 (1977): 70. Maginnis, Hayden B. J. "The Literature of Sienese Trecento Painting 1945-1975." Zeitschrift für Kunstgeschichte 40 (1977): 289. Meiss, Millard. "Notes on a Dated Diptych by Lippo Memmi." In Scritti di storia dell’arte in onore di Ugo Procacci. 2 vols. Edited by Maria Grazia Ciardi Dupré Dal Poggetto and Paolo Dal Poggetto. Milan, 1977: 1:139. Torriti, Piero. La Pinacoteca Nazionale di Siena. I Dipinti dal XII al XV secolo. Genoa, 1977: 90. Ressort, Claude, Sylvia Beguin, and Michel Laclotte, eds. Retables italiens du XIIIe au XVe siècle. Exh. cat. Musée National du Louvre, Paris, 1978: 19. De Benedictis, Cristina. La pittura senese 1330-1370. Florence, 1979: 20, 91, 93. Shapley, Fern Rusk. Catalogue of the Italian Paintings. National Gallery of Art. 2 vols. Washington, 1979: 1:331-333; 2:pl. 241. Zeri, Federico, and Elizabeth E. Gardner. Italian Paintings: Sienese and Central Italian Schools. A Catalogue of the Collection of the Metropolitan Museum of Art. New York, 1980: 50-52. Brejon de Lavergnée, Arnauld, and Dominique Thiébaut. Catalogue sommaire illustré des peintures du Musée du Louvre. 2, Italie, Espagne, Allemande, Grande-Bretagne et divers. Paris, 1981: 206. Christiansen, Keith. "Fourteenth-Century Italian Altarpieces." Bulletin of the Metropolitan Museum of Art 40 (1982): 26, fig. 25. Natale, Mauro, Alessandra Mottola Molfino, and Joyce Brusa. Museo Poldi Pezzoli. Vol. 1 (of 7), Dipinti. Milan, 1982: 145. L’Art gothique siennois: enluminure, peinture, orfèvrerie, sculpture. Exh. cat. Musée du Petit Palais, Avignon. Florence, 1983: 142. Bagnoli, Alessandro, and Luciano Bellosi, eds. Simone Martini e “chompagni”. Exh. cat. Pinacoteca Nazionale, Siena. Florence, 1985: 28. European Paintings: An Illustrated Catalogue. National Gallery of Art, Washington, 1985: 231, repro. Conti, Alessandro. "Simone Martini e ‘chompagni’: Siena, Pinacoteca Nazionale, March 27-October 31, 1985." Bollettino d’arte 71, nos. 35-36 (1986): 102. Tartuferi, Angelo. "Appunti su Simone Martini e ‘chompagni.’" Arte cristiana 74 (1986): 86, 92 n. 32. Boskovits, Miklós, ed. Frühe italienische Malerei: Gemäldegalerie Berlin, Katalog der Gemälde. Translated by Erich Schleier. Berlin, 1988: 74, 75. Martindale, Andrew. 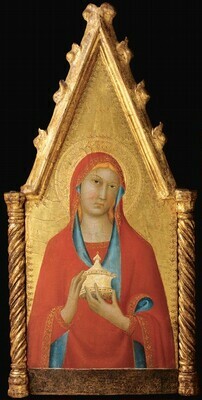 Simone Martini. Oxford, 1988: 29, 59, fig. 132. Previtali, Giovanni. "Introduzione ai problemi della bottega di Simone Martini." In Simone Martini: atti del convegno; Siena, March 27-29, 1985. Edited by Luciano Bellosi. Florence, 1988: 160, 161, 166 nn. 22 and 26. De Benedictis, Cristina. "Lippo Memmi." In Enciclopedia dell’arte medievale. Edited by Istituto della Enciclopedia italiana. 12 vols. Rome, 1991-2002: 7(1996):733. Cannon, Joanna. "The Creation, Meaning and Audience of the Early Sienese Polyptych: Evidence from the Friars." In Italian Altarpieces, 1250-1550: Function and Design. Edited by Eve Borsook and Fiorella Superbi Gioffredi. Oxford, 1994: 60 n. 122, pl. 54. Carli, Enzo. La pittura a Pisa dalle origini alla Bella Maniera. Pisa, 1994: 56. Baetjer, Katharine. European Paintings in the Metropolitan Museum of Art by Artists Born before 1865. A Summary Catalogue. New York, 1995: 45. Frinta, Mojmír S. Punched Decoration on Late Medieval Panel and Miniature Painting. Prague, 1998: 189, 205, 247, 298, 311, 400. Bagnoli, Alessandro. La Maestà di Simone Martini. Cinisello Balsamo (Milan), 1999: 142, 151 n. 184. Leone De Castris, Pierluigi. Simone Martini. Milan, 2003: 181, 218 n. 49. "Memmi, Lippo." In Dictionnaire de la peinture. Edited by Michel Laclotte and Jean Pierre Cuzin. Paris, 2003: 640. Secrest, Meryle. Duveen: A Life in Art. New York, 2004: 458, 461. Lonjon, Marianne. "Précisions sur la provenance du retable dit ‘de Colle di Val d’Elsa’ de Lippo Memmi." La revue des musées de France 56 (2006): 34, 38 n. 1, 39 n. 13, figs. 5-7. Foucart-Walter, Elisabeth, and Jean-Pierre Habert, eds. Catalogue des peintures italiennes du Musée du Louvre: Catalogue sommaire. Paris, 2007: 41. Boskovits, Miklós, and Johannes Tripps, eds. Maestri senesi e toscani nel Lindenau-Museum di Altenburg. Exh. cat. Santa Maria della Scala, Siena, 2008: 28-37. Bellosi, Luciano, et al., eds. La collezione Salini: dipinti, sculture e oreficerie dei secoli XII, XIII, XIV e XV. 4 vols. Florence, 2009, 2015: 1(2009):147, 148 repro. Spannocchi, Sabina. "Lippo e Tederigo Memmi." in La Collegiata di San Gimignano, vol. 2, l’architettura, i cicli pittorici murali e i loro restauri. Edited by Alessandro Bagnoli. Siena, 2009: 450. Boskovits, Miklós. Italian Paintings of the Thirteenth and Fourteenth Centuries. The Systematic Catalogue of the National Gallery of Art. Washington, 2016: 203-214, color repro. Reconstruction of a dispersed polyptych by Lippo Memmi. [fig. 11] Lippo Memmi, Saint Elizabeth of Hungary, probably c. 1325, tempera on panel, Museo Poldo Pezzoli, Milan. Image: Fondazione Artistica Poldo Pezzoli ""Onlus""
See George Kaftal, Saints in Italian Art, vol. 1, Iconography of the Saints in Tuscan Painting (Florence, 1952), 549–550; Alexandre Masseron, Saint Jean Baptiste dans l’art (Paris, 1957). The blessing gesture used in the Greek Church is performed with the forefinger, ring finger, and little finger extended or, as in Lippo’s panel, with thumb, forefinger, and little finger extended. See E. Fehrenbach, “Bénir (manière de),” in Dictionnaire d’archéologie chrétienne et de liturgie, ed. Fernand Cabrol and Henri Leclercq, 15 vols. (Paris, 1925), 2, pt. 1:746–758. On the formats of Sienese polyptychs, and in particular of Simone in the period indicated, cf. Joanna Cannon, “Simone Martini, the Dominicans and the Early Sienese Polyptych,” Journal of the Warburg and Courtauld Institute 45 (1982): 69–93. Musée du Louvre, Paris, no. M.I. 690, 94 × 44.2 cm; Metropolitan Museum of Art, New York, no. 88.3.99, 93.3 × 43.7 cm; Staat­liche Museen, Gemäldegalerie, Berlin, no. 1067, 77.5 × 55.5 cm (calculating only the dimensions of the original part of this panel, which was cropped at an early date and later elongated in its upper part by a 9 cm-high modern addition). Federico Zeri reported Evelyn Sandberg-­Vavalà’s manuscript opinion; Federico Zeri and Elizabeth E. Gardner, Italian Paintings: Sienese and Central Italian Schools; A Catalogue of the Collection of the Metropolitan Museum of Art (New York, 1980), 51. However, Raimond van Marle had perhaps already recognized the New York and Paris panels as probable components of the same multipart altarpiece, noting stylistic affinities between these two works and the Madonna in Berlin. Raimond van Marle, Simone Martini et les peintres de son école (Strasbourg, 1920), 108–109. The paintings in question are: Yale University Art Gallery, New Haven, no. 1943.239, 104.9 × 44.6 cm; Pinacoteca Nazionale, Siena, nos. 49 (105 × 46 cm), 48 (105 × 46 cm); cf. Helen Comstock, “The World’s Fair and Other Exhibitions,” Connoisseur 103 (1939): 275–277. “[Lippo] fece​ . . . ​in San Paolo a Ripa d’Arno​ . . . ​la tavola a tempera che oggi è sopra l’altar maggiore, dentrovi una Nostra Donna, San Piero, San Paolo e San Giovan Batista ed altri Santi; e in questa pose Lippo il suo nome” (Lippo made in San Paolo a Ripa d’Arno the tempera painting that today stands on the high altar, in which is Our Lady, Saint Peter, Saint Paul, and Saint John the Baptist, and other saints; and Lippo put his name to this painting): Giorgio Vasari, Le vite dei più eccellenti pittori, scultori ed architettori, ed. Gaetano Milanesi, 9 vols. (Florence, 1878), 1:554–555. Klara Steinweg cautiously suggested that the two panels of Saint Peter and Saint Paul (now respectively in the Musée du Louvre, Paris, and the Metropolitan Museum of Art, New York) belonged to this polyptych. Klara Steinweg, “Beiträge zu Simone Martini und seiner Werkstatt,” Mitteilungen des Kunsthistorischen Institutes in Florenz 7 (1956): 168 n. 23. Gertrude Coor, “Two Unknown Paintings by the Master of the Glorification of St. Thomas and Some Closely Related Works,” Pantheon 19 (1961): 131–132, 135 n. 25. Cristina De Benedictis, “A proposito di un libro su Buffalmacco,” Antichità viva 13, no. 2 (1974): 7–8. The busts in question are here considered works produced by Simone Martini’s shop (see Saint Matthew, Saint Simon, Saint James Major, and Saint Judas Thaddeus). Michael Mallory, “An Altarpiece by Lippo Memmi Reconsidered,” Metropolitan Museum Journal 9 (1974): 187–202; Michael Mallory, “Thoughts Concerning the ‘Master of the Glorification of St. Thomas,’” The Art Bulletin 57 (1975): 18–20; Marianne Lonjon, in Retables italiens du XIIIe au XVe siècle, ed. Claude Ressort, Sylvia Beguin, and Michel Laclotte (Paris, 1978), 19. Rhode Island School of Design, Providence, no. 21.250, 51.5 × 24.5 cm; Metropolitan Museum of Art, New York, no. 64.189.2, 39.4 × 19.1 cm (painted surface; with modern frame, 48.3 × 20.3 cm); Frick Art Museum, Pittsburgh, no. 1970.38, 40 × 18.9 cm (painted surface of each; with modern frame, 63.3 × 24 cm and 63.3 × 24.5 cm, respectively); and Museo Poldi Pezzoli, Milan, no. 3343, 50.5 × 22 cm. Federico Zeri first recognized the panel as belonging to the polyptych being discussed here in 1976 (Zeri to Marianne Lonjon); cf. Marianne Lonjon, “Précisions sur la provenance du retable dit ‘de Colle di Val d’Elsa’ de Lippo Memmi,” La revue des musées de France 56 (2006): 38, n. 2. 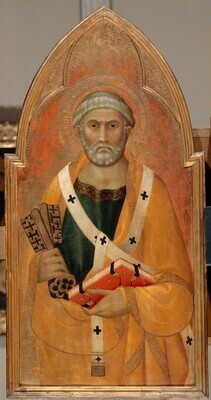 Cristina De Benedictis subsequently published it as an image of Saint Augustine, whereas Lonjon identified the saint in question as the patron of San Gimignano. However, the fact that the saint wears the black cloak of the Augustinian canons makes the former proposal more convincing. Cf. Cristina De Benedictis, “Mario Salmi collezionista,” in Studi di storia dell’arte sul Medioevo e il Rinascimento: Nel centenario della nascita di Mario Salmi (Florence, 1992), 125–136. Hayden Maginnis’s observation (1977) of the differences between the punched decoration of the Madonna in Berlin and that of the panels thought to have formed the main register of the polyptych seemed convincing to the present writer (1988), who noted that the back of the panel of the Madonna lacks the layer of gesso present in other panels of the polyptych. From this and a few other small differences, the conclusion has been drawn (and largely shared in the art historical literature) that the Berlin Madonna cannot have formed part of the polyptych from the Franciscans of San Gimignano. Further reflection (and also closer inspection of the back of the Berlin panel, which reveals that it has been slightly thinned and probably stripped of the layer of gesso with which it was originally covered) has now strengthened my suspicion that the painting in question, whose stylistic and chronological closeness to the other components of the San Gimignano polyptych is generally recognized, could possibly have formed part of it. Cf. Hayden B. J. Maginnis, “The Literature of Sienese Trecento Painting 1945–1975,” Zeitschrift für Kunst­geschichte 40 (1977): 289; Miklós Boskovits, ed., Frühe italieni­sche Malerei: Gemäldegalerie Berlin, Katalog der Gemälde, trans. Erich Schleier (Berlin, 1988), 75. Collection Comte Oriola, formée en Italie de 1860-1896 env. : Tableaux, sculptures, tapisseries . . . acquis en grande partie des collections Bardini, Borghese etc., vente publique à Amsterdam, direction Mensing & Fils, le 13 avril 1932 (Amsterdam, 1932), lot. 3. Undated copy of expertise in NGA curatorial files. Raimond van Marle, Le scuole della pittura italiana, vol. 2, La scuola senese del XIV secolo (The Hague, 1934), 210; Raimond van Marle, Italiaansche Kunst in Neder­landsch Bezeit (Amsterdam, 1934), 85. Copies of the expertises by Bernard Berenson, Giuseppe Fiocco, Roberto Longhi, Wilhelm Suida, and Adolfo Venturi are in NGA curatorial files. See Helen Comstock, “The World’s Fair and Other Exhibitions,” Connoisseur 103 (1939): 277; Wilhelm Suida, “Die Sammlung Kress: New York,” Pantheon 26 (1940): 274; Robert Langton Douglas, in Duveen Brothers, Duveen Pictures in Public Collections of America (New York, 1941), no. 13. Cf. also Duveen Brothers Records, accession number 960015, Research Library, Getty Research Institute, Los Angeles: reel 121, box 266, folder 18 (copy in NGA curatorial files); George Martin Richter, “The New National Gallery in Washington,” The Burlington Magazine for Connoisseurs 78 (1941): 177; and Alfred M. Frankfurter, The Kress Collection in the National Gallery (New York, 1944), 21 (repro. ), 63. Hermann Beenken, “Review of Le scuole della pittura italiana II by Raimond van Marle,” Zeitschrift für Kunstgeschichte 4 (1935): 356. Guglielmo Matthiae, “In margine all’esposizione d’arte italiana ad Amsterdam,” Rivista del R. Istituto d’archeologia e storia dell’arte 5 (1935): 217. For Robert Langton Douglas’s opinion, cf. Duveen Brothers, Duveen Pictures in Public Collections of America (New York, 1941), no. 13, and Duveen Brothers Records, accession number 960015, Research Library, Getty Research Institute, Los Angeles: reel 121, box 266, folder 18. Manuscript opinion, dated March 23, 1940 (copy in NGA curatorial files). Unpublished draft review intended for Art News (copy in NGA curatorial files). Klara Steinweg, “Beiträge zu Simone Martini und seiner Werkstatt,” Mitteilungen des Kunsthistorischen Institutes in Florenz 7 (1956): 167; Cristina Maria Gozzoli, in Gianfranco Contini and Maria Cristina Gozzoli, L’opera completa di Simone Martini (Milan, 1970), 105 no. 54; Sebastiana Delogu Ventroni, Barna da Siena (Pisa, 1972), 59. Giovanni Previtali, “Introduzione,” in Simone Martini e “chompagni”, ed. Alessandro Bagnoli and Luciano Bellosi (Florence, 1985), 28. Ever since 1952, when Federico Zeri firmly asserted the authorship of Lippo Memmi, most art historians have accepted this attribution (with the exceptions mentioned above); Federico Zeri, “An Exhibition of Mediterranean Primitives,” The Burlington Magazine 94 (1952): 321. But sometimes the polyptych has been given to “Barna” and hence reassigned to the Memmi shop, as part of the recent tendency to consider the paintings previously cataloged under the name Barna as part of the production of the bottega “of the Memmi family.” Charles Seymour (1970) thus considered it executed at least in part by “Barna.” Giovanni Previtali (1988) also described it as a production of the family shop. Alessandro Conti (1986) spoke with regard to the Gallery Baptist of a so-called Master of Asciano (the anonymous master to whom he attributed the Madonna in the local museum, usually given to Barna), and Giulietta Chelazzi Dini (1985) considered at least the Saint Francis and Saint Louis of Toulouse in the Pinacoteca of Siena to be the work of the Master of the Triumph of Saint Thomas Aquinas (Santa Caterina, Pisa), sometimes attributed to Barna, but perhaps identifiable, according to Chelazzi Dini, with the young Francesco Traini. There are also those who have supported the common authorship of Lippo and his brother Tederico for the San Gimignano polytych (Bagnoli 1999, Leone De Castris 2003). See Charles Seymour, Early Italian Paintings in the Yale University Art Gallery (New Haven and London, 1970), 92; Giovanni Previtali, “Introduzione ai problemi della bottega di Simone Martini,” in Simone Martini: Atti del convegno; Siena, March 27–29, 1985, ed. Luciano Bellosi (Florence, 1988), 160, 161, 166 n. 22, 26; Alessandro Conti, “Simone Martini e ‘chompagni’: Siena, Pinacoteca Nazionale, March 27 – ​October 31, 1985,” Bollettino d’arte 71, no. 35–36 (1986): 102; Giulietta Chelazzi Dini, in Simone Martini e “chompagni,” ed. Alessandro Bagnoli and Luciano Bellosi (Florence, 1985), 88; Alessandro Bagnoli, La Maestà di Simone Martini (Cinisello Balsamo, Milan, 1999), 142, 151 n. 184; Pierluigi Leone De Castris, Simone Martini (Milan, 2003), 181, 218 n. 49. In particular, Giovanni Previtali cast doubt on the credibility of Lippo’s signature: he suggested that in the polyptych of San Paolo a Ripa d’Arno in Pisa, a work signed by Lippo according to the sources and now dispersed among the museums in Altenburg, Palermo, Pisa and elsewhere, the drawing and at least part of the execution should be attributed to Simone Martini, and that this master was also partially responsible for the execution of the Madonna in the church of the Servi in Siena, signed by Lippo. Previtali also believed that an intervention by Lippo was probable in the execution of the polyptych in the Museo dell’Opera del Duomo of Orvieto, although it bears the signature of Simone Martini. See Giovanni Previtali, “Introduzione,” in Simone Martini e “chompagni,” ed. Alessandro Bagnoli and Luciano Bellosi (Florence, 1985), 27–28. This latter hypothesis more recently was revived by Bagnoli, who maintained with some assurance the common authorship of Simone and Lippo for the polyptych in Orvieto. 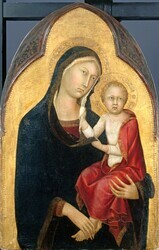 See Alessandro Bagnoli, La Maestà di Simone Martini (Cinisello Balsamo, Milan, 1999), 142. The former Golovin Baptist is particularly suited to comparison with the painting in Washington; cf. An Exhibition of Italian Panels and Manuscripts from the Thirteenth and Fourteenth Centuries in Honor of Richard Offner (Hartford, 1965), 24, no. 24; Millard Meiss, “Notes on a Dated Diptych by Lippo Memmi,” in Scritti di storia dell’arte in onore di Ugo Procacci, ed. Maria Grazia Ciardi Dupré Dal Poggetto and Paolo Dal Poggetto, 2 vols. (Milan, 1977), 1:137–139. Admittedly, after the drastic cleaning to which the New York painting has been subjected it is difficult to assess its modeling, but its composition, its restless contours, or the impulsive gesture of the saint himself can leave no doubt about the panel’s belonging to a later stylistic phase than the Baptist in the Gallery. For the polyptych of Casciana Alta, originally intended for Pisa Cathedral, the presence of Saint Thomas Aquinas, canonized on July 18, 1323, constitutes a secure terminus post quem. But even irrespective of this date, the more elongated proportions of the figures and the delicacy of the chiaroscuro imply that the polyptych was painted several years after Simone’s polyptych in Santa Caterina in Pisa. On the polyptych of Casciana Alta, see in particular Luciano Bellosi, in Simone Martini e “chompagni,” ed. Alessandro Bagnoli and Luciano Bellosi (Florence, 1985), 94–102. With regard to the Santa Caterina altarpiece, for which the contribution of Michael Mallory (1975) remains fundamental, the so-called Master of the Triumph of Saint Thomas to whom Mallory and some other scholars attributed it is now generally identified with Lippo (or Lippo and shop). See Michael Mallory, “Thoughts Concerning the ‘Master of the Glorification of St. Thomas,’” The Art Bulletin 57 (1975): 9–20. The caution of suspecting that a second artist worked alongside Lippo Memmi, one devoid of any real art historical substance or even biographical foundation—such as Tederico Memmi, a documented personality but perhaps not an artist, or “Barna,” likely a wholly fictitious character—seems unjustified. Mojmir S. Frinta (1998) pointed out the presence of the punch mark he called “complex tetra-lobe (tetrafoil)” both in the panel in the Gallery and in the former Chiaramonte Bordonaro Saint Peter (now in the Galleria Nazionale in Palermo). This punch also recurs in other Lippo works, including the Casciana Alta polyptych and the triptych of the Annunciation dated 1333 in the Uffizi, Florence, executed in collaboration with Simone Martini. See Mojmir Svatopluk Frinta, Punched Decoration on Late Medieval Panel and Miniature Painting (Prague, 1998), 400. Cf. Fern Rusk Shapley, Paintings from the Samuel H. Kress Collection: Italian Schools, XIII–XV Century (London, 1966), 49; Fern Rusk Shapley, Catalogue of the Italian Paintings, 2 vols. (Washington, DC, 1979), 1:333. Infrared reflectography was performed with a Hamamatsu c / 1000-03 Vidicon camera fitted with an N2606-10 or N214 lead sulphide tube. The painting is reproduced within a nineteenth-century frame of rectangular shape both in the 1932 sale catalog and by Raimond van Marle (in 1934 and 1935). Apparently, it maintained the appearance given to it during an undocumented nineteenth-century restoration and was not subjected to any further treatment before its acquisition by Duveen Brothers, Inc., by 1938. See Raimond van Marle, Le scuole della pittura italiana, vol. 2, La scuola senese del XIV secolo (The Hague, 1934), 210, fig. 142; Raimond van Marle, “La pittura all’esposizione d’arte antica italiana di Amsterdam,” Bollettino d’arte 27 (1935): 297, fig. 4.